In April 1924 the F.VII made its maiden flight. The F.VII and its derivatives were to revolutionise air transport. Slowly, but steadily, the F.III's capacity had become inadequate for the rapidly expanding air traffic, and KLM in particular was pushing for a larger successor. On December 10th, 1923, KLM signed a temporary contract for three F.VIIs, with an option on another three later on. The order would be confirmed if the prototype proved satisfactory during practical use. In 1924 the first F.VII went into service with KLM. Five in total were built in 1924-25. Ever since the end of World War One plans had existed for a flight to the Dutch East Indies, and during the design of the F.VII the requirements for such a flight had been taken into account. In particular, the undercarriage was strongly constructed to allow for the bad landing fields expected along the route. The F.VII had a Rolls-Royce Eagle engine, and its cabin could accommodate eight passengers. A separate luggage compartment was provided, and also a toilet. The improved version, with rounded wingtips, ailerons moved inboard from the wing tips, and a simplified undercarriage, was designated F.VIIA, and was 22 km/hr faster than the F.VII and more manoeuvrable. The Fokker F.VIIA flew on 12 March 1925 with a 298kW Packard Liberty engine. Following a demonstration tour of the United States, a number of orders were secured and further orders came from European operators. Almost 50 single-engined F.VIIAs were built, some of which were converted later to F.VIIA-3m standard with three engines. Early in July 1925 Fokker cabled Platz in Amsterdam to say that a three-engined F.VII was to be built. Platz executed this order in eight weeks. To avoid extra testing and design, he suspended the additional engines beneath the wing of an F.VIIA. After a demonstration for KLM, the F.VIIA/3m, as it was later called, was shipped to the USA, where Fokker flew the aircraft from New York to Detroit on September 26th. After the Ford Reliability Tour Fokker made the F.VIIA/3m prototype available to the Army Air Corps for testing from Wright Field. After this military goodwill tour, the air­craft was flown to Detroit to be inspected by Edsel Ford, who purchased it. He then made the aircraft available to Lt Comman­der Richard Byrd, who used it to become the first to fly an aircraft over the North Pole on the 9th May 1926, naming the Fokker F.VIIa/3M Josephine Ford. Seven were built by Curtiss as RA-3. American military designation for the F.VIIB/3m was C-2. The Royal Dutch East Indies Army took over two F.VIIB/3ms, equipped with Titan engines, from the Royal Dutch East Indies Airlines Company. They also used five F.VIIB/3ms with Lynx engines. Sabena relied on a fleet of Fokker F.VIIb/3ms until they were replaced by Savoia-Marchetti S.73s. One was supplied to the RAF, the only example known to have been used by the military in World War II was the 12th production F.VIIA which, after a chequered career in the Netherlands and Denmark, was presented to the Finnish Red Cross and operated in military markings in the Continuation War which began in 1941. Those operated by the Netherlands and Polish air forces were destroyed at an early stage of the German invasion of these two nations. The Fokker F.VIIb-3m one of two aircraft, both of which had crashed, and its wing had been united to the other aircraft, a single-engined F.VIIA. 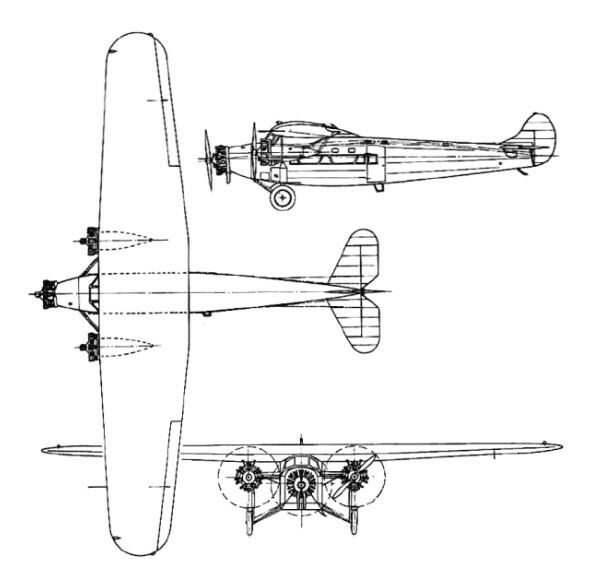 This hybrid had also crashed, and eventually the wing of the tri-motor, and the fuselages of both machines, had been shipped back to the Seattle Boeing factory, where the Tri-motor wing and fuselage were reunited, and the rear fuselage, fin and rudder redesigned to give greater stability. The reconditioned aircraft was re-designated Fokker F.VIIb-3m, and was sold, with Wright J4 engines and no instruments, to Kingsford-Smith, who eventually had it fitted with the later Wright Whirlwind J5 engines, and crossed the Pacific in it in June 1928, with Charles Ulm as co-pilot. The high cantilever thick-section wing consisted of two wooden box spars and plywood ribs, the whole being skinned with plywood. The fuselage and tail unit were welded steel-tube structures, covered mainly with fabric. Narrow chord ailerons were fitted to the main wing. 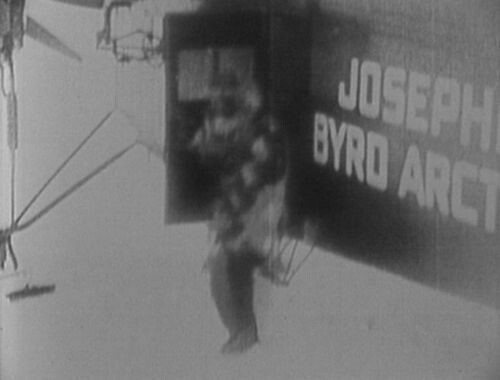 The prototype Trimotor was used by Admiral Byrd on the first flight over the North Pole in May 1927. Licence-production was also undertaken in Belgium, Italy, Poland and the UK (as the Avro Ten). Approximately 184 were built. 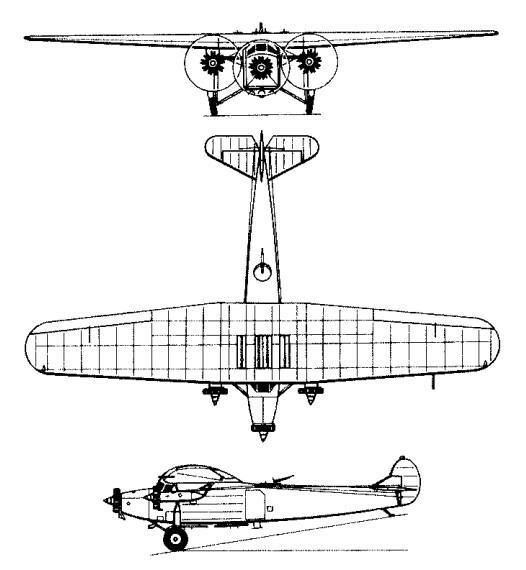 The F.VIIb-3m was also licence built as the Avro 618 Ten circa 1929. The Avia F-VIIb /Fokker VII.B/3M monoplane was built under licence as the first transport plane from 1931. It was tested in the Scientific Aeronautical Institute as a bomber as the S-19, and as a transport by the Czechoslovak Air Liners Comp. Engine: 1 x Rolls-Royce Eagle. Engines: 3 x 215 h.p. Armstrong Siddeley Lynx. Max cruise: 106 mph (170 kph). Ceiling: 15,500 ft (4,700 m) fully loaded. Range: 500 miles (800 km). Engines: 3 x Wright Whirlwind J5. Span 63 ft. 4 in.